Mauritius has a long history of rum production thanks to the abundance of sugar cane that the island produces - all over the world wherever sugar cane is grown, there's rum, and Mauritius is no different. As such the supermarkets are full to the brim with local varities ranging from the insanely cheap and a little bit nasty, to the truly delicious. Every time I go to Mauritius I make a point of trying as many as possible, with my favourite of recent years being Green Island Spiced Gold, a lightly spiced golden rum with hints of vanilla thats great on its own or with coke. It costs between £4 and £5 a bottle in Mauritius but between £25 and £30 over here, if you're lucky enough to find some. This time around though there was a different brand which really caught my eye, mainly because the bottle looked so damned good, New Grove Mauritius Island Oak Aged Rum. 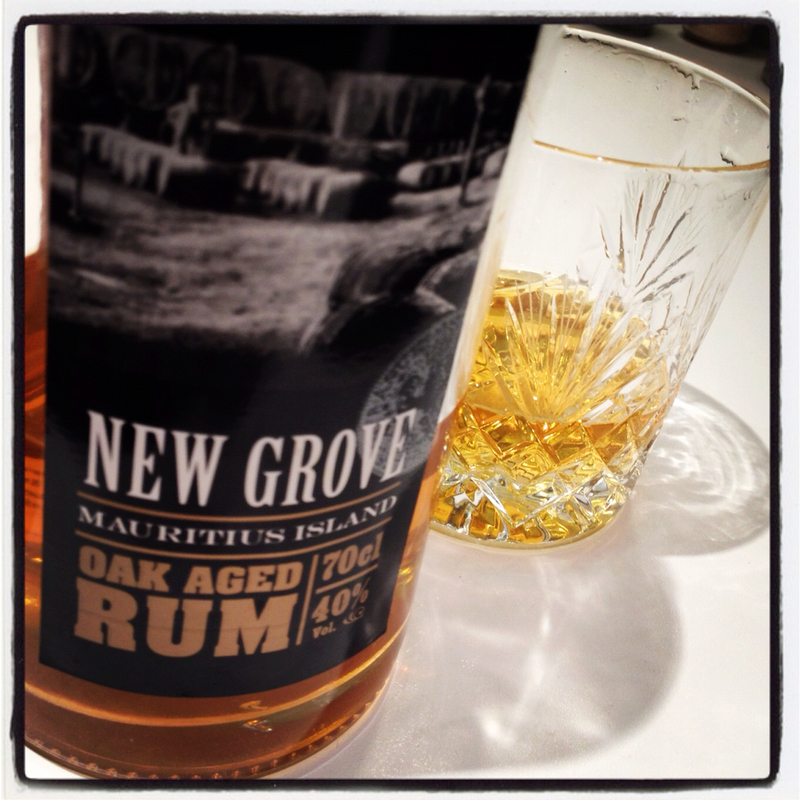 New Grove produce a number of rums but it was the two oak aged dark/golden rums that caught my eye. This time around I picked up the regular Oak aged version, which I believe is aged for 3 years in oak casks, rather than the more fancy 5 year version that is aged in, amongst others, oak casks that have been home to port. My thinking being to try this one and pick up the other next time round if this was any good. You can see from the photo that the bottle is half empty, which is testament to how tasty this stuff is. Drank neat with just a splash of cold bottled water it's unbelievably moreish and drinkable, with an aroma of juicy plump sultanas, smokey oak, exotic fruit and brown sugar. The taste is more of the same with the smooth brown sugar and sultanas front and centre, backed up by spikes of wood smoke and pepper. It's a very clean, smooth drinking, yet complex rum and not the sugar bomb you might expect. Really delicious stuff, and something which I think would make a fantastic twist on an "old fashioned", one of my all time favourite cocktails, which is normally made with bourbon or rye whiskey. My thinking is that the fruity sweetness and lightly smokey flavours of this rum would dovetail nicely with the orange peel and bitters of an old fashioned. I'll give it a go soon and let you know how it turns out. Watch this space.